FSMIS (December 27, 2013): At a handover ceremony held at the FSM President's Office, Mr. Kasio E. Mida, Chairman of the College of Micronesia-FSM Board of Regents, and COM-FSM Acting President Joseph Habuchmai represented the college in receiving a $100,000 donation from the Tan Siu Lin Foundation. The donation was formally announced during the occasion of the trip by Federated States of Micronesia President Manny Mori to Hong Kong last month, during which the President also availed time to meet with the FSM Honorary Consul in Hong Kong, Dr. Tan Siu Lin. Dr. Tan is the founder and chairman of the foundation. Before giving the check to the college representatives, President Mori commented on the usefulness of the donation, which compliments the FSM's long-term priority for post-secondary education. He also acknowledged the work done by Ambassador Akilino H. Susaia, FSM Ambassador to China, which expedited the processes to bring in this specific assistance. On behalf of the COM-FSM community, Mr. Mida thanked President Mori and conveyed the college's appreciation for his strong support over the years. He also remarked, "the gift from the Tan Sui Lin Foundation is greatly appreciated and welcome, and we will make sure the college will make good use of it to strengthen its programs for and services to our students". COM-FSM Acting President Habuchmai joined Mr. Mida in highlighting the college's gratitude toward the Tan Siu Lin Foundation and thanked the FSM Government for its part in securing the assistance. To protect supporters' confidence in COM-FSM, President Mori encouraged the college to put in place a particular system for the acceptance of assistance such as this in a manner that mutually addresses the good intentions of the donor and the prioritized needs of the college. Present with President Mori were Secretary of Foreign Affairs Lorin Robert, Ambassador Susaia and Chief of Staff Leo Falcam Jr.
FSMIS (December 27, 2013): On December 26, 2013, the Government of Japan and the FSM Government held an Exchange of Note signing ceremony at the FSM Department of Foreign Affairs for a Non-Project Grant Aid that will enable the Provision of Industrial Products. This is the second Exchange of Notes signing ceremony this year. The first one took place in August, and it marked the Project for the Improvement of Domestic Shipping Services in the FSM. The new project in the amount of two hundred million Japanese Yen (about $1.9 million U.S.) will be utilized to purchase industrial products manufactured by the disaster-affected areas caused by the Great East Japan Earthquake that struck Japan in 2011. This Non-Project Grant is intended to support and facilitate the FSM’s efforts to improve its infrastructure and persevere towards boosting its economy. This ceremony marks the third Non-Project Grant Aid the FSM government has received from Japan. In his remarks, Japan Ambassador Eiichi Suzuki highlighted the uniqueness of the ceremony as it marks the first time that two Exchange of Notes take place within one year. He said that the event speaks of the continued fortification of the ties between the FSM and Japan. On the receiving end, FSM Foreign Affairs Secretary Lorin Robert thanked the Government of Japan for their continuous support and friendship with the FSM and remarked that the signing ceremony is special as the receiving of the grant coincides with the merriment of the Holiday Season. Secretary Robert and Ambassador Suzuki were joined at the ceremony by various staff of the Department and the Embassy of Japan. For further information, call the Department at 320-2641 or email fsmpio@mail.fm. 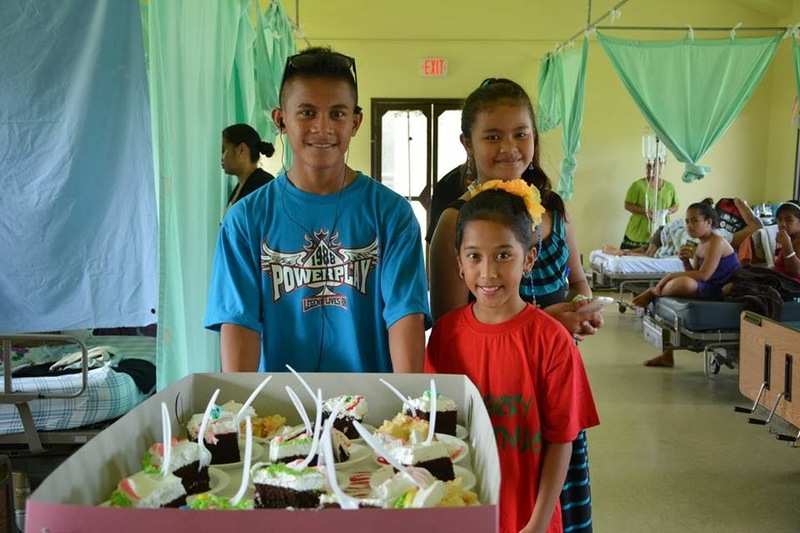 First Lady Emma greeted a young boy patient during visit at the Pohnpei State Hospital on December 25, 2013. Family members look on with appreciation. 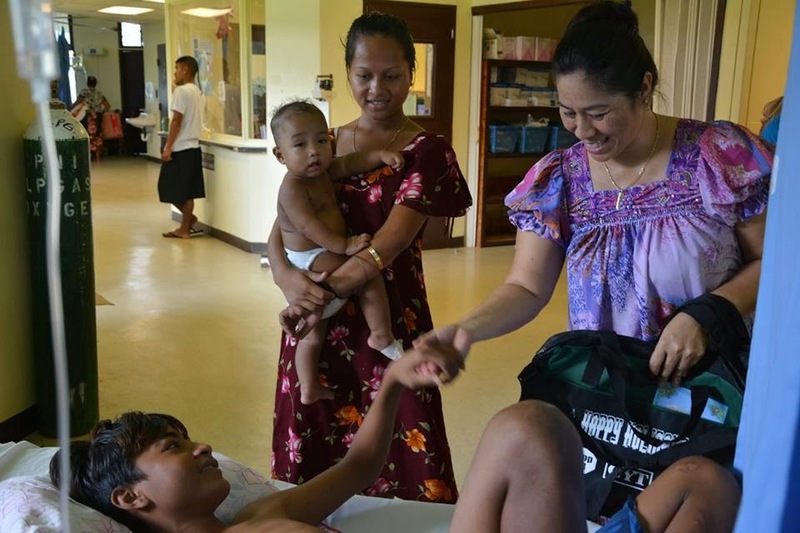 FSMIS (December 26, 2013): This Christmas marks the sixth year that the Federated States of Micronesia First Lady Emma Nelson-Mori has made visits to patients and their families at the Genesis Hospital and the Pohnpei State Hospital on Christmas Day. While it is not easy for family and friends to spend the Christmas Day at the hospital, this annual tradition by the First Lady brings holiday cheer to those who find themselves confined to the hospitals on this very day. Done by the first Lady on hers and the President's behalf in the giving spirit of Christmas, a less obvious significance of the day for the First Family in relation to their tradition is the fact that the President's birthday falls on the 25th of December. Mrs. Mori visited all wards and greeted each patient with a gift and cake. As the First Lady and others got busy at the two hospitals, Chief of Staff Leo Falcam Jr. and Special Assistant to the President Pelsesar Petrus visited the Pohnpei State Jailhouse in Nett and delivered food as part of the President's Christmas gift-giving. FSM Typhoon relief assistance to the Philippines, Honorary Consul says "thank you"
FSMIS (December 24, 2013): In the morning of December 23, in a brief ceremony at the President's Office, Federated States of Micronesia President Manny Mori, on behalf of the FSM Government, presented a check of $100,000 as a token of support to the on-going relief efforts for the families affected by Super Typhoon Haiyan, which hit parts of the Philippines on November 8. Dr. Merlynn Abello-Alfonso, Honorary Consul of the Government of the Philippines in the FSM, made herself available to accept the check on behalf of Government of the Philippines. At the ceremony, President Mori said that as a small country, the FSM can only give so much. 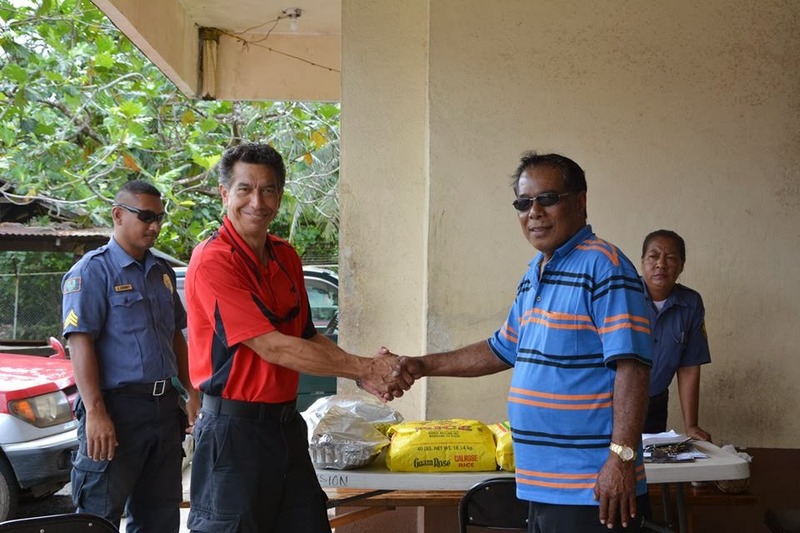 However, he stressed more on the FSM's "gesture of support" and wish for the availability of much needed assistance to the affected families as recovery efforts progress. Dr. Abello thanked President Mori and highlighted the Government of the Philippine's appreciation of the FSM's "gesture of support". She said the amount of money would be used in the most appropriate way in helping the families and individuals who are picking up after the devastating typhoon. President Mori wrote to Philippine President Benigno Simeon Aquino III on December 20, "Our 18th Congress of the Federated States of Micronesia during its recent special session, made a token appropriation to help ease the burdens on your nation caused by Typhoon Haiyan". He also said , "no words are enough to ease the pain and hardship for the loss of lives and property" caused by the disaster. At the brief ceremony, President Mori also extended his best wishes to the Filipino Association of Pohnpei, which has been active in community-support initiatives, including fundraisers for the victims of Super-Typhoon Haiyan. The FSM relief assistance is part of an appropriation that became law on December 13, which also includes relief assistance to the FSM State of Yap, the Republic of Palau, and the Socialist Republic of Vietnam. Mrs. Boylan, getting ready for the pledge of allegiance while husband and sons watch from the side. President Manny Mori administers the oath. On December 17, Carrie Lynn Boylan became the second person in the history of the Federated States of Micronesia to obtain FSM citizenship through the new naturalization process when she renounced her US citizenship and received the Oath of Allegiance from President Manny Mori. Mrs. Boylan’s father, Russel Jay Varner, is a US citizen and her mother, Rene’e Etscheit-Varner, a Pohnpeian from Nett Municipality, which made Mrs. Boylan a national of the FSM. Pursuant to a change in the law, FSM nationals may apply for and be granted citizenship under Presidential approval. Mrs. Boylan applied to become an FSM citizen by renouncing her US citizenship and applying for FSM citizenship through this new process. Aliens (those individuals who are not born or adopted to an FSM father or mother), need Congressional approval to become FSM citizens. The FSM Constitution does not allow adults to hold dual citizenship, that is, a citizen of both the FSM and another country. However, when a child, who has at least one FSM citizen parent, is born in another country or to a parent who is a citizen of another country, the child maintains citizenship in both countries until, within three years after reaching his or her 18th birthday, the child chooses which citizenship he or she wants to keep. If no election is made, then the child automatically becomes a national and loses his or her citizenship. Mrs. Boylan was born in California, USA and moved to Pohnpei when she was less than two years old, where she grew up. She later went back to the USA to receive her education and after that came back and stayed in Pohnpei to date. Mrs. Boylan and her family have been engaged in the business commercial sector in Pohnpei State for more than 15 years. She is the operator and owner of Perfume and Things and is also the operator and owner of Varner Boylan Corporation, a real estate agency. Mrs. Boylan is married and has 4 children, 3 of whom were born in Pohnpei. Present for the naturalization ceremony were family and friends of Mrs. Boylan as well as Foreign Affairs Secretary Lorin Robert, Justice Secretary April Dawn Skilling, and Chief of Staff Leo Falcam, Jr.
The19th Micronesian Chief Executives’ Summit in Saipan ended on the 6th of December after three days of meeting. The six Governors and three Presidents from all the States, Territory, Commonwealth and National Governments in Micronesia discussed a range of issues with guidance from selected professionals, practitioners, academicians, leaders and high level staff members from within their various jurisdictions. Climate Change: Climate Change discussions highlighted the obvious fact that many of the islands in Micronesia are already being drastically affected by various impacts of climate change. This imminent experience explains why the Leaders agreed to continue exert efforts in climate change mitigation and adaptation. Under the same subject, the Leaders congratulated Governor Eddie Baza Calvo of Guam for his appointment to the Presidential Commission on Preparing the US for effects of Climate Change. Governor Calvo was requested to assist other Micronesian entities in the context of this newly appointed role to "gain funding for appropriate adaptation projects". The Marshall Islands raised awareness of fellow Leaders to the existing Majuro Declaration on Climate Leadership endorsed by Pacific Islands Forum countries at the 44th Pacific Islands Forum in Majuro a few months back. Micronesian Challenge: Considered a "success story" for the region, the Micronesian Challenge (MC) continues to garner the support of the Chief Executives in its expanded efforts, which now includes the development of the Micronesian Challenge Business Plan. The MC presenters indicated that $11 million is spent annually for the protection of more than 6,800 square kilometers of conservation reserves in the region. The MC hopes to achieve a total of 13,500 square kilometers of protected areas by 2020. The MC Business Plan "establishes a commitment to raise an additional $42 million across the region" ($7 million annually) to match projected costs for meeting the initiative's conservation targets. Regional Health Insurance: The Chief Executives viewed components of a proposed regional healthcare plan that originates from the Association of Pacific Islands Legislators (APIL). Various indicated benefits of contributing to a region-wide healthcare plan were explored along with a recommendation for the need of a regional study to be conducted to better situate its potentials based on the experiences of current stand-alone plans in the MCES jurisdictions. The Leaders expressed interest in the concept of a regional medical insurance plan and the prospects on the benefit of pooling resources for such plan. In a separate side-meeting, the Presidents of the FSM, the Marshall Islands and Palau agreed to extend the College of Micronesia Treaty, subject to legislative approval, to September 30, 2023 as recommended by the COM Board of Regents. "COM Land Grant federal programs are operated through the 'Treaty Among the Governments of the Republic of the Marshall Islands, the Federated States of Micronesia and the Republic of Palau Regarding College of Micronesia'". At the latest status, the treaty was effective until September 30, 2013. The Chief Executives held a separate session that involved officials from the US Department of the Interior that mostly concerned a report from the US Government on the impact of an estimated 56,000 citizens of the Freely Associated States residing in US jurisdictions. The Leaders had the opportunity to express their view on the report. The Governor of Guam "indicated his disappointment in the overall movement of the U.S. Government and the Department of Interior on issues of Compact Impact, especially the failure to develop a template for the measurement of impacts, failure to report in a timely fashion to the U.S. Congress and the failure to respond to overall health care, education, corrections and other impact issues". Other Leaders expressed concern regarding data compilation in the process for determining compact impacts. The Leaders also touched on the issue of the status of the Micronesian Center for a Sustainable Future (MCSF), which is seen as a coordinating organ for the MCES. The DOI suspended a grant in February 2013 and support for the Center were put on hold. As one of the last actions for the Summit, the Leaders agreed to improve the configuration of the MCSF to strengthen its secretariat function and be more responsive to the MCES. Additionally, three resolutions also resulted from the Leaders' deliberations. Resolution 19-01 pledges "expanded support of the Micronesian Chief Executives for existing regional, national and local initiatives to implement invasive species awareness, impact assessment and research, management and biosecurity programs and the continued support for the implementation of the Micronesian Biosecurity Plan". Resolution 19-02 underscores the Chief Executives' recognition of and support toward the "social and economic development of the region through enhanced telecommunications capacity in the Republic of Palau and the Federated States of Micronesia". Resolution 19-03 stresses the Chief Executives' "recognition of the accomplishments of Francis X. Solomon, an advisor of the Prior Service Program and the first director of the Technical Assistance Program at the Office of Insular Affairs and commemorating his death of August 22, 2013". The Leaders also acknowledged the action taken by the Hawaii Invasive Species Council (HISC) which adopted a resolution in support of the development of the Micronesian Biosecurity Plan (MBP). A letter from the Leaders expressing appreciation for the State of Hawaii’s supportive action was sent to Governor Neil Abercrombie with request for Hawaii’s full participation in the development of the MBP and inclusion in the Micronesian Invasive Species Council as a non-voting member. As a tribute to a departed Statesman, the Chief Executives took time to honor the passing away of President Nelson Mandela. A moment of silence was observed. Before closing, the Leaders expressed their gratitude to the Government and people of the Commonwealth of the Northern Mariana Islands and announced that the 20th MCES will be held in Yap State in the Federated States of Micronesia. The specific date for the next meeting will be determined and announced by Yap State. The following is a link to the 19th MCES communique ( the outcome of the meeting). Feedback can be obtained via fsmpio@mail.fm or by calling the Public Information Office at 320-2548. FSMIS (December 20, 2013): Radio & TV Tonga recently reported that the Tonga Communication Corporation (TCC) "has launched its new 3G network for mobile customers" in Tonga. The new network makes welcoming improved internet access for mobile customers, "especially those in rural areas". It has made the downloading and uploading of movies and other data much efficient using a speed of 2 megabits per second. Previous capacity was 3 hundred kilobit per second. Prior to the installation of this fiber optic cable service, TCC customers could only settle for a very low network coverage for the internet and limited data applications. A previous news release from the FSM Telecom reported that the "phase one" fiber optic cable project in the FSM, which completed a cable line linkage to Guam's cable, stated that "all islands will be able to realize more reliable and expanded services such as improved voice calling and faster Internet as a result of the completion of phase one". It also stated that the linkage to Guam would ultimately open up access to a 10G network to allow for high-speed connectivity. The report from Tonga would add anticipation in places like the FSM where they are currently aspiring not only to access high-speed internet connectivity but bring internet capacity beyond the "city-centers" to nearby and remote islands. The Statement below is from the Pacific Islands Forum Secretariat. The FSM is a Forum Member. The keenly anticipated final report from the Pacific Plan Review 2013 is now available online. The Rt. Hon. Sir Mekere Morauta, the Review’s chair, submitted the report to Leaders on October 31st, calling for “a new level and quality of political debate, policy and cooperation at the regional level”. The Review report presents 36 recommendations to Leaders, including the development of a new Framework for Pacific Regionalism – “better to guide the region through the short term and to secure the long term in a way that properly reflects the values and diversity of the region while managing the common natural resources on which all Pacific islanders depend”. At their meeting to consider the report in early December, the Forum Officials Committee agreed that it could be made public—while noting that its recommendations were still under review by Leaders. Copies are now available for download from the Review website (www.pacificplanreview.org/review-team/team-documents/), or can be requested in print or electronic form from the Forum Secretariat. UNFPA-funded nation-wide house to house survey on family safety and protection, and analyzing and compiling the survey results into a final report. It is a six months period from December 2013 to June 2014. All other specific information regarding the above project can be obtain from the office of the Secretary, Department of Health and Social Affairs. FSMIS (December 19, 2013): FSM President Manny Mori transmitted a communication to the Asian Development Bank in which he stated his appreciation to ADB for the assistance rendered by its Senior Economist, Mr. Norio Usui, to the 2023 Planning Committee meeting in Saipan on December 7-8, 2013. "I am pleased to inform you that Mr. Usui delivered the key presentation in the last meeting, which articulated a credible picture of the expected fiscal shortfall ahead, and simplified the forthcoming fiscal challenges to best fit the understanding of the Committee and Cabinet members who were present at the meeting." President Mori also specifically requested for Mr. Usui's service in January, 2014 to assist the Committee in making the same presentation to and answering questions from State and National Leadership with regards the administration's strategy to grow the Nation's economy. Also mentioned in the letter to Mr. Xianbin Yao, Director General of the Pacific Department of the Asian Development Bank, was a statement reiterating the FSM Government's "urgent need for a resident macroeconomist" to assist in the work on a "strategy for 2023". FSMIS (December 19, 2013): The College of Micronesia-FSM Board of Regents has announced reaching an agreement with Dr. Joseph M. Daisy, extending his tenure as President of the college until January, 2016. Dr. Daisy has been the President of COM-FSM for the past two years. In a letter to the Federated States of Micronesia (FSM) President Manny Mori, the chairman of the COM-FSM Board of Regents, Mr. Kasio E. Mida, indicates that Dr. Daisy's first two years "have been marked by a culture of continuous quality improvement which has instilled a renewed sense of unity, success, and pride" for the college community. "His leadership has helped COM-FSM come together as a learning community, embed participatory governance into the life of the college, and become a purposeful institution based upon a culture of evidence", Mr. Mida states. The board has decided to retain Dr. Daisy who is seen as a "visionary, dynamic leader" for the college to further build a more beneficial future of post-secondary education for FSM students within their home atmosphere. Hails from Boston, Massachusetts, Dr. Daisy is the fifth President of the College of Micronesia-FSM. In addition to Ms. Osnat Lubrani’s country visit agenda as the new UN Resident Coordinator and United Nations Development Program Resident Representative to the Federated States of Micronesia based in Suva, Fiji she also took time to learn firsthand the work happening in country by the FSM GEF Small Grants Program. On December 07, 2013 Ms. Lubrani site visited an aquaculture project at Marine and Environmental Research Institute of Pohnpei (MERIP) to witness in effect the alternative livelihood and income benefit potentials derived from aquaculture to select communities involved with the project at a project site in Madolenihmw. Mr. Simon Ellis Executive Director of MERIP generously hosted Lubrani and shared MERIP’s vision in support of developing alternative benefits to communities, in particular adjacent communities located nearby Marine Protected Areas (MPA) network. It is the hope of MERIP that providing aquaculture incentive projects would help reduce inshore fishing pressures thus the connectivity of the initiative with MPA fishers communities. Ms. Lubrani also had the opportunity to visit Nan Madol an ancient archeological site built upon stone and reefs a true engineering marvel as testament of Pohnpei’s vibrant culture and unique heritage. Efforts by Pohnpei State and FSM Historic office are evolving to establish the site as part of the World Heritage listing. Finally on December 10, 2013 as a concluding visit highlight Ms. Lubrani had the opportunity to launch a new SGP project with the Conservation Society of Pohnpei (CSP) signing on behalf of UNOPS, and UNDP a project MOA which would provide $50,000.00 USD in support of a project titled “A Community-Based Approach to Supporting the Implementation of the Nagoya Protocol on Access and Benefit Sharing (ABS) through Sustainable Management and Connectivity of Floras and People in Pohnpei, FSM”. Acting Director Mary Linda Salvador of CSP signed project MOA on behalf of the CSP. Ms. Lubrani congratulated CSP on this occasion and glad to have signed the project in support of community-based implementation of the Nagoya Protocol on ABS as pilot project demonstration. For more information on the FSM GEF Small Grants Programme feel free to call its office at (691) 320-4192 or e-mail at joylynneg@unops.org. Governor Anefal of Yap says he can not point to a particular outcome from of the December 7-8 meeting of the 2023 Planning Committee as something to "walk away with" for his particular State. However, he is ready to work with his counterparts and the FSM National in building a roadmap in addressing budget issues in relation to expected shortfalls in the Compact Trust Fund. For more on his views, see the video clip display. On December 6, 2013, Ms. Osnat Lubrani, the new UN Resident Coordinator and United Nations Development Program Resident Representative to the Federated States of Micronesia based in Suva, Fiji presented her letter of credence to Mr. Samson E. Pretrick, Acting Secretary of the FSM Department of Foreign Affairs, in a formal ceremony at the Department of Foreign Affairs’ conference room. During the ceremony, Acting Secretary Pretrick welcomed Ms. Lubrani to the FSM and congratulated her as the new Resident Coordinator and UNDP Resident Representative to the Pacific Region and the FSM. He thanked her for making time to visit the FSM to formally present her Credentials. Acting Secretary Pretrick informed Ms. Lubrani that he was very happy to receive her letter of credence on behalf of the FSM Government. He noted that the letter and her visit reaffirm the close working relationship that exists between the FSM and UNDP. He also expressed the FSM’s appreciation for UNDP’s role as an implementing agency for many projects in the areas of environment, conservation and biodiversity. Lastly, he indicated that the FSM will continue to work with UNDP in the implementation of these beneficial projects. Ms. Lubrani thanked Acting Secretary Pretrick and expressed her readiness to work with the FSM Government. They discussed some areas which needed further cooperation and collaboration, especially the review of the UN Development Assistance Framework (UNDAF), the Millennium Development Goals (MDGs), the Convention on the Elimination of all forms of Discrimination Against Women (CEDAW) and other UN related issues. Attending the ceremony, were Mr. Okeen Ehmes, Country Development Manager of the UN Joint Presence, representative from World Health Organization (WHO), staff froms the Department of Foreign Affairs and staff of the FSM Public Information Office. During her short visit in the FSM, Ms. Lubrani also paid a courtesy call on the Vice-President Alik L. Alik and heads/representatives of each department and agency. Ms. Lubrani left Pohnpei on Tuesday, December 10, 2013. FSM-DOJ (Dember 17, 2013): On December 11, 2013, at approximately 5.20 a.m, a fish carrier, Ping Da7 ran aground on Nankepinparam reef within the territorial sea of Pohnpei State, Federated States of Micronesia. The vessel is owned by Jiang Hai Ping of Zhejiang province, China, operated/chartered by New Shipping Co., LTD. Of Nanjing, China and registered in the Republic of Kiribati with an international call sign of T3HF2. The President and the Governor of Pohnpei State have activated a joint task force to assist the owner and vessel operators in removing the vessel from the reef in the safest way possible and putting in place emergency measures to prevent further damage to the reef and environment.